A goes-with-everything stylish nappy bag - the Il Tutto Ellyse Tote! A goes-with-everything stylish nappy bag – the Il Tutto Ellyse Tote! There’s no need to compromise on style when carrying all of the baby paraphernalia Babyologists, the Il Tutto collection of baby bags is forever brimming with elegant new options. Today I give you my favourite, a luxury nappy bag which doesn’t scream Look at me, I’m carrying half the nursery change table! The Ellyse Nappy Bag Tote from the home of amazing baby bags, Il Tutto, promises years of use, many of those serving long after you need to carry nappies, changes of clothes, snacks and bottles. A full leather tote, the Ellyse Nappy Bag Tote is an awesome all rounder, the bag which will effortlessly work with any and all outfits. I adore the understated details of the centre front suede panel, matching suede mini tassles and micro studs in a luxe polished gold finish. Easy on the eye, the quality of Il Tutto bags is reflected in the bag build. 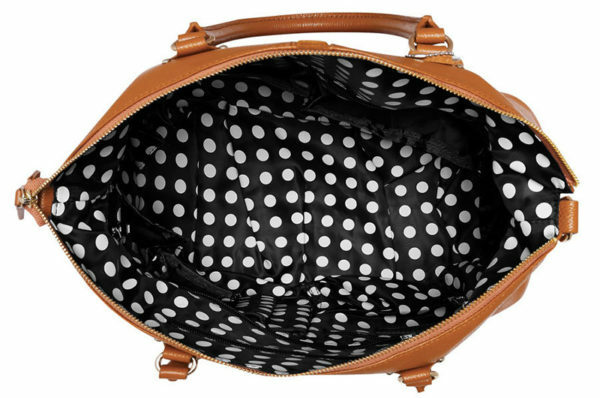 The roomy interior of the Ellyse bag showcases Il Tutto’s signature polka print lining, which conveniently zips out for easy cleaning. A handy phone pouch means you’ll always be able to find your phone before it rings out. The large exterior back zip is perfect for keeping the things you need to locate in an instant – rusks, dummies, favourite toys. Included with the bag is a detachable shoulder strap for easy cross body carrying, a new design collectable monster teddy charm and the all important baby essentials – insulated bottle holder, wet pouch and padded change mat – all in coordinating polka print. 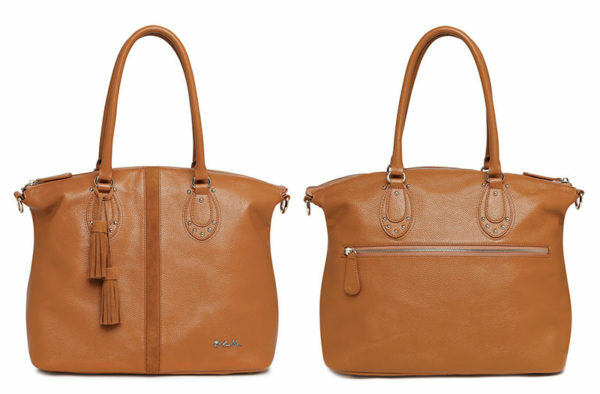 The Ellyse leather tote nappy bag is available in tan, black and duck egg blue. Order direct from Il Tutto, priced $399.